This tire inflator was originally designed to complement our TPMS in order for the drivers to temporary inflate the tires when the TPMS alerts the driver of under-inflation. This robust tire inflator comes in a neat carry nylon case and also 3 different types of nozzles to inflate other items such as air mattresses, balls, bicycles, etc. The unit can be easily stored in the vehicle and is also part of the safety pack of vehicles in many countries that are also mandatory. 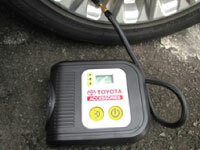 The compact tire inflator is equipped with a pressure gauge for exact pressure requirements and also a deflate button if the tire is over-inflated. The safety valve will release the air from the side of the compressor to prevent over-inflation if it is left unattended.